Moroccan peacekeepers serving with the UN Multidimensional Integrated Stabilization Mission in the Central African Republic (MINUSCA). The United Nations peacekeeping mission in the Central African Republic (CAR) today condemned a deadly ambush on a convoy in the south-eastern part of the country which killed two blue helmets from Morocco and wounded two others. “No claim can justify that individuals direct their grievances against peacekeepers whose presence [here] has no other objective than to help the country to end this cycle of violence,” warned the Special Representative of the Secretary-General in the country, Parfait Onanga-Anyanga. In a statement, Mr. Onanga-Anyanga, who is also the head of UN Multidimensional Integrated Stabilization Mission in CAR, known by its French acronym MINUSCA, added that “every effort” will be made to track down those responsible and bring them to justice. An attack on a peacekeeper may constitute a war crime. According to MINUSCA, the attack took place about 60 km (37 miles) west of Obo. The convoy was heading to the city with fuel picked up at Zemio when unknown insurgents surprised them, killed two peacekeepers, and then escaped into the bush. Speaking to UN News from Bangui, MINUSCA’s spokesperson, Vladimir Monteiro, said the two injured peacekeepers are receiving treatment, one of them for severe injuries. Attacks such as these are not only on UN peacekeepers, Mr. Monteiro said, but also on humanitarian actors and particularly the civilian population. Clashes between the mainly Muslim Séléka rebel coalition and anti-Balaka militia, which are mostly Christian, plunged the country of 4.5 million people into civil conflict in 2013. Despite significant progress and successful elections, CAR has remained in the grip of instability and sporadic unrest. In December 2016, the Mission supported a new dialogue between 11 of the 14 armed groups, as part of an ongoing effort to disarm the factions. “MINUSCA is still pushing to adhere to this dialogue,” Mr. Monteiro said. 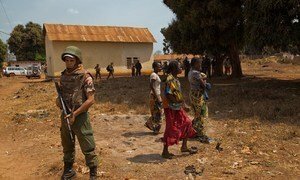 Expressing deep concerns over last week's renewed violence in the Central African Republic that has reportedly claimed dozens of lives and displaced more than 11,000 persons – many civilians – United Nations Secretary-General has called on the armed groups to immediately and to “genuinely” commit to peace.